Asia Tune Hotel offers spotless, modern rooms for surprisingly low rates. Asia Tune is a new-build hotel not far from the Riverside neighborhood that offers a plethora of spotless rooms at surprisingly low rates. The hotel is ideally located just a few blocks from the Riverside promenade, within walking distance of the bars and nightlife around the river and to the south on Street 172. It’s also just a five-minute walk to the Royal Palace or National Museum and two streets away from Kandal Market. The Asia Tune Hotel has clean, modern rooms. Rooms at Asia Tune Hotel are clean and modern, with new furniture and bedding. Each room comes equipped with a powerful air-conditioner, mini-bar, safe, writing desk, and 32-inch flat-screen LCD TV on the wall. 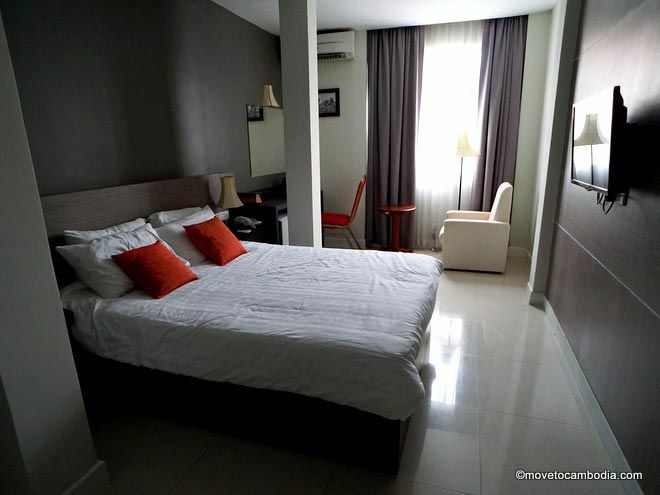 Superior rooms at Asia Tune Hotel are similar to Standard rooms but are significantly larger and have higher ceilings. Rooms also include a buffet breakfast that serves fresh fruit, juice, coffee and tea and Asian and Western dishes. When we visited, there were fried noodles, congee, eggs, sausages, and various other breakfast standards. Asia Tune Hotel gym. Yes, that’s a jiggle machine in the back. 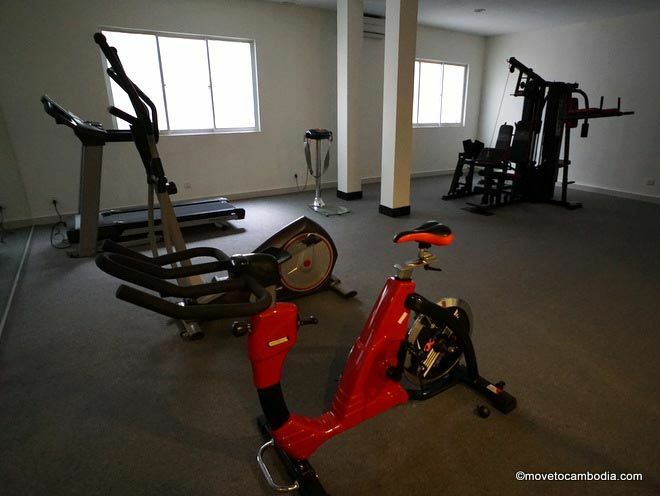 The hotel advertises a fitness room and while it does exist, it is probably not going to impress a true fitness buff. The gym has a treadmill, elliptical, exercise bike, weight-lifting machine, and one of those crazy contraptions that uses a belt around your middle to jiggle you into healthfulness. Less impressively, the staff seemed fairly clueless and the WiFi was erratic. While we were there it was clear that on our floor a lot of bandwidth hogging was going on, because the speed was glacial until after a large group checked out in the morning. 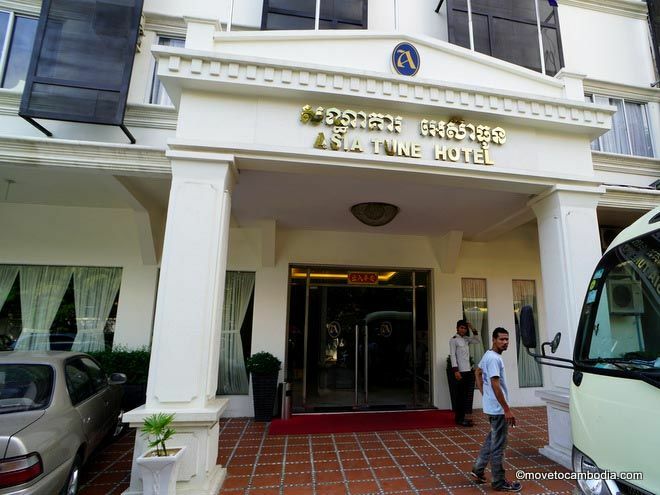 The Asia Tune Hotel: slightly uninspiring but excellent value for money. Although the hotel seems to host a fair number of Asian tour groups, the rooms are all strictly non-smoking, and we saw no evidence that this rule was being broken. Overall, the hotel is slightly uninspiring, but the rooms are very nice and offer seriously excellent value for money. The list prices for the rooms range from $55 to over $100. As with most Cambodian hotels, they’re usually not willing to stray from the listed price, so it’s better to book on Agoda or Booking.com, which offers the same rooms for less than half as much, with Standard rooms starting at $35 in low season. → Check prices and book a room at on Booking.com or Agoda now. Looking for more? View the full Phnom Penh city guide for tips on where to stay, what to eat, and things to see and do.